Satisfy an urge for adventure on a half-day zip line canopy tour of an award winning ecological park from Playa del Carmen. Soar over the jungle on 12 ultra-thin zip line cables designed to propel you at incredible velocity. Race through an obstacle course and ascend a rugged rock wall before plunging into the refreshing waters of a cenote for a swim. Feel secure and safe with expert supervision from an experienced guide on this exhilarating excursion. Round-trip hotel transportation and snacks are included in the tour. Departs from centrally located Playa del Carmen hotels. If your hotel is outside the pickup zone, a central meeting point will be advised on reconfirmation. Hotel pickups commence prior to your chosen tour time. Exact pickup time will be advised on reconfirmation. 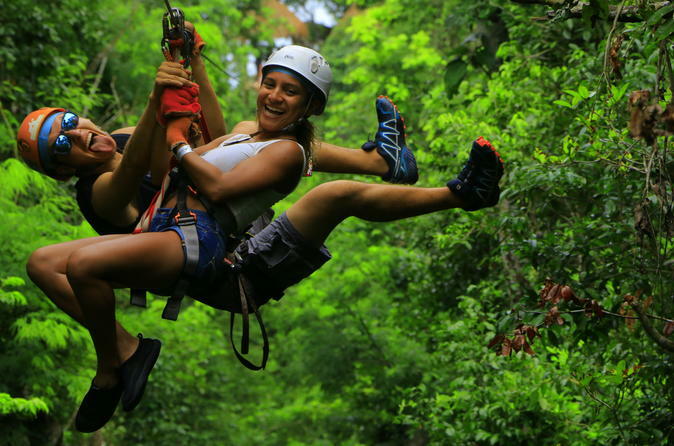 Greet your driver at your Playa del Carmen hotel and venture deep into the jungle to the ecological park of Selvatica. See why the prestigious park was awarded the coveted World Travel Award for best adventure park in Latin America as you arrive at the base camp. Listen to an informative safety briefing from your experienced guide and practice using your state-of-the-art equipment. Don your protective gear and feel your pulse quicken as you begin the journey to your first platform. Gaze at the verdant canopy below before clipping on and zipping off down a collection of lines covering 1.5 miles (2.4 km) of jungle landscape. Smile as you reach super-fast speeds on the super-thin steel cables, marveling at the beauty of the flora and fauna below. If you feel confidant, ride upside down with your experienced guide for a unique perspective of the vibrant rainforest. Then, board a powerful army jeep and ride the second part of your adventure, an energizing obstacle course. Scale a rock wall then soar down your final zip line to splash into the transparent waters of a cenote below. Freshen up in the excellent facilities and re-energize with a snack and cold beverage before purchasing action-shots of your adventure for a special souvenir. Enjoy a well-deserved rest during the return journey to your Playa del Carmen hotel.